Preaching to the Wrong Church! A friend of the website had been listening to conservative Christian radio stations for the past several years. And quite often, he would hear a certain name mentioned! It was the name of a popular conservative Bible teacher. And every time that Bible teacher’s name was mentioned, the person mentioning him, without fail, began to heap all sorts of laud and praise upon that popular Bible teacher! So this listener’s curiosity grew concerning this “apparent” icon of biblical fidelity and truth. Just why was this famous Bible teacher so greatly revered? Well, eventually the day came when this website’s friend finally got the chance to listen to this very admired and popular Bible teacher. But much to his surprise, it was such a let-down for him! Oh, it wasn’t that this Bible teacher was teaching heresy! No, this Bible teacher was staying pretty much within the parameters of the Bible. And no, he wasn’t disappointed in the man’s personal character. Rather this Bible teacher seemed to be the very icon of morality! No, the big problem was, that this popular Bible teacher was committing the very same error, which is very common among so many other r adio and TV Bible teachers, in this current dismal condition of the Church. And just what is that great error? You see, this very popular Bible teacher was preaching to the wrong church! Now how in the world could a radio Bible teacher be preaching to the wrong church!? Yes, the Christian community in this decadent society has become the, “Lukewarm” church. The opulent church! But in reality, he was preaching to Lukewarm Laodiceans! And sadly, this is the common error which is so prevalent in today’s pulpits. The fact is, it is Satan’s great purpose today, to keep the Church in total spiritual slumber, and yet in a self-deceived presumptuousness! And so, Satan makes us think we are shoe-ins for Heaven! And he speaks through very many shepherds today, constantly telling their flock, that all is, “peace and safety” (see 1st Thess. 5:3). And this has created a condition in today’s churches that can only be described as follows… “For the time will come when they will not endure sound doctrine; but after their own lusts shall they heap to themselves teachers, having itching ears; And they shall turn away their ears from the truth, and shall be turned unto fables.” 2nd Tim. 4:3, 4. Now what this Bible teacher should have been doing, was to give a straight testimony to us Laodiceans: a wake-up call, that we are in great peril! Yes, this message to the Laodicean church, is the very message that should have been hammered over and over again, into the very depths of our consciousness! And so, just as John the Baptist gave Israel the straight unvarnished truth, so also, should we be declaring to our brothers and sisters in spiritual Israel, our great peril! Well, we conservative Christians (Jerusalem) love to point the finger-of-indignation at all those liberal churches (Samaria), not realizing that we too have filled our lives with many of the modern-day idols: the gods of ambitious careers. The gods of excessive amusements. The gods of inordinate television watching, and radio listening. The gods of money-getting, and all the things that money buys: excessively expensive vehicles, and luxury vacation-resorts, and ivy-covered houses and lands, and divers kinds of pleasure-vehicles. All the many decadent pleasures and proud, ambitious pursuits of this cornucopian super-society. Yes, these popular Bible teachers should have warned us not to encourage our children to obtain a high-priced education in the schools of Babylon, so that they could pursue a time-consuming career, heaping up to themselves, earthly riches and Mammon, up to the sky! These teachers should have warned us that we were wrongly encouraging our children to pursue the very same decadent opulence which eventually led the inhabitants of Sodom into all sorts of debauchery, which ultimately caused the destroying fire of God to come down upon that city. Mall Market culture Jakarta – Wikimedia – share-alike-lic. Instead, these teachers should have constantly encouraged us to follow Paul’s admonition… “And having food and raiment let us be therewith content. But they that will be rich fall into temptation and a snare, and into many foolish and hurtful lusts, which drown men in destruction and perdition.” 1st Tim. 6:8, 9. These are the very words of God, given to us through the voice of the apostle, Paul, who lived what he preached. You see, Paul lived a life of self-imposed poverty, that he could give all, even as his Lord gave all! Yes, Paul’s self-sacrificing life stands as a rebuke to all us so-called “conservative” Christians. Truth-be-told, we’ve come to the day when the itching-ears prevail! But the Good News is this: God has provided living waters for all those who choose to come out of spiritual Babylon. Listen… “And there shall be upon every high mountain, and upon every high hill, rivers and streams of waters in the day of the great slaughter, when the towers fall.” Isaiah 30:25. We are in that very day, in which we much flee to the top of heavenly Sion! But God has made abundant spiritual provisions for all those who take flight! Above picture is a concept picture and not a star-chart. If a person goes out at night, beginning in April (earlier in southern-most latitudes, and later in northern-most), in the pre-dawn hour, they just might locate the constellation commonly referred to as the Sagittarius Constellation . It is located in the southern sky. (Each night it appears a little earlier, slowly inching westward, through the summer, until it finally disappears below the western horizon in November.) At first, it simply appears as two twin birds flying westward. But if you look once again, it just might appear as a long box-like figure, with one star on the right, as you face it, and two stars on the left. The box, of course would be the Ark, and the stars on either side would represent angels, which are sometimes referred to as stars in the Bible (for instance, “the seven stars are the angels…” Revelation 1:20). 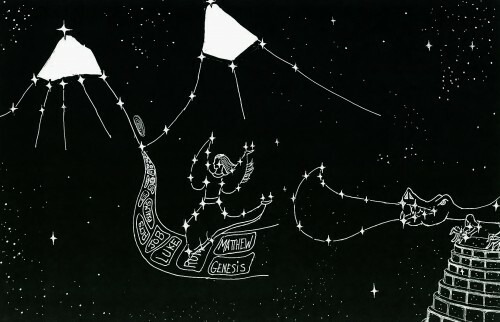 To the right is a star-chart from Wikipedia, in which the editor of this site has sketched in this Sagittarius Constellation, to show how God created it to appear.